This is the third and final volume in CPO's survey of Austrian composer - and famed conductor - Felix Weingartner's complete String Quartets. Volume 1 was released in 2008 and is enthusiastically reviewed here. Volume 2 contains his fifth and final Quartet paired with his single String Quintet. CPO have also issued six volumes of Weingartner's impressive Symphonies, with a final seventh, containing his Seventh, still to appear (see warm review of Second). As a conductor Weingartner was instrumental in deflating the cult of showmanship that had grown around soloists and conductors throughout the nineteenth century, and turning the focus once more on music and composer. Opinions regarding his quiet, economical style at the podium have no relevance here, though. Weingartner considered himself first and foremost a composer, and his music, though conservative to a degree, is almost without exception emotive, beautiful and profound. None more so than these two highly imaginative Quartets, which are quite outstanding in their expressiveness, lyricism and brilliance. They reflect a deeply engaging amalgam of Beethoven and Schubert on the one hand, and - in their harmonic lushness and frequent chromaticism - Strauss and Zemlinsky on the other. 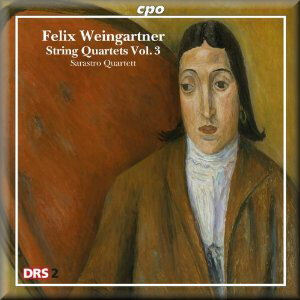 The Swiss Sarastro Quartet have by now internalised Weingartner's style, having recorded both previous volumes. Here, once again, they are sympathetic and charismatic in their technical prowess and emotional insight. CPO's resident note-writer, musicologist Eckhardt van den Hoogen, has previously shown a tendency towards prolixity and highfalutin phraseology. This release is no different, but his essay on Weingartner is remarkable for another, altogether more unsavoury reason - an extraordinary twelve-column character assassination of the musician whose music CPO and the Sarastro Quartet are trying to sell! Hoogen portrays Weingartner in loaded, often sarcastic language ("turning up his nose", "crucified with the rusty nails of his craving for glory", "people wished he would go to hell", "schizoid" and even "in virtually psychotic manner") as an almost universally unloved aristocratic prima donna, flitting from one conducting post to the next when things did not go exactly his way. There seems little doubt that Weingartner was argumentative, easily offended and something of a self-serving Machiavellian, but Hoogen's notes are astoundingly personal, to the degree that he comes across more as a twenty-something academic blogger with a grudge than as a balanced biographer. At least Hoogen has the decency to recognise the brilliance of Weingartner's music, yet even when discussing the Quartets he uses the opportunity to resurrect, amid flimsy insinuations and unsubstantiated accusations, the old shibboleth as to whether any music-lover - right-minded, no doubt - should take an interest in the works of an artist with an unpleasant personality. At least the translation into English is good. But the overall prestige of the note-writing is not improved by a semi-literate biography of the Sarastro Quartet. On the other hand, there is a Weingartner-on-CPO discography for all those - surely everyone - left wanting more by this superb volume. Sound quality is very good - much better than many CPO recordings. As is virtually de rigueur in quartet recording, some breathing sounds are audible, but nothing excessive.